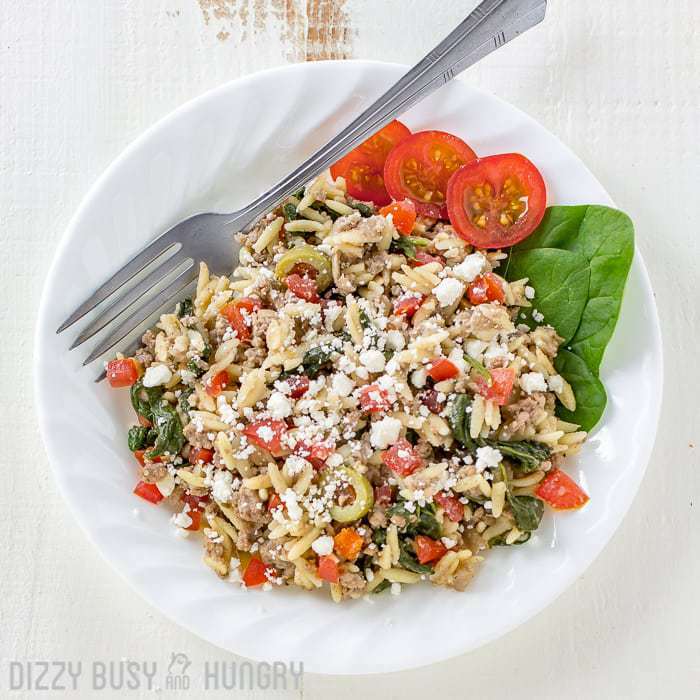 Beef and Orzo Skillet Meal | Dizzy Busy and Hungry! 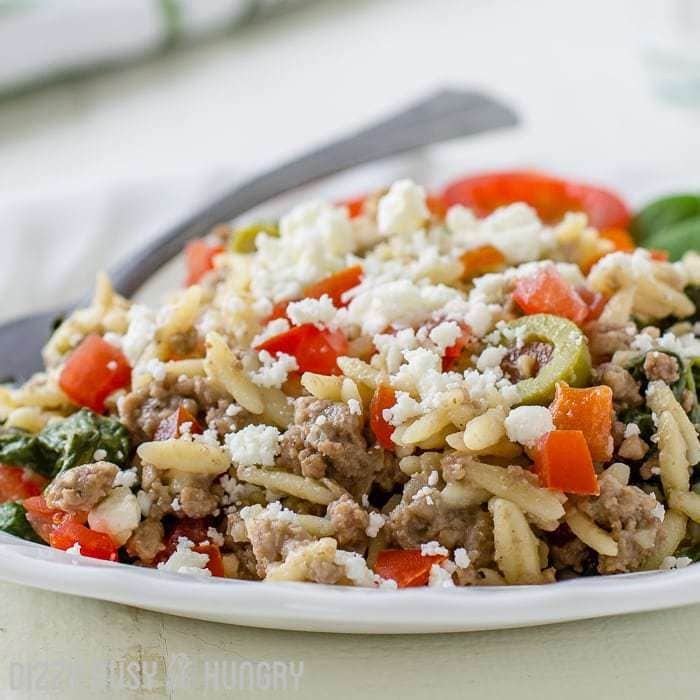 If you like easy ground beef recipes you can make in one pan, you will love this hearty and delicious Beef and Orzo Skillet Meal! One skillet meals are da bomb! With easy prep and easy cleanup, these meals are perfect for the busiest days. 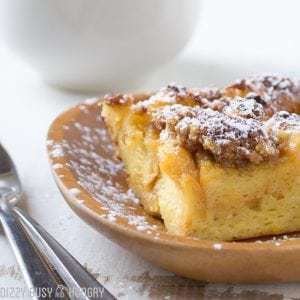 I like to plan on making this recipe for when I know we will have very little time in between getting home from work and school and heading out to the evening activities. Another thing I really love about this recipe is that I always have leftovers, which make a great lunch for the next day or a quick meal later in the week for a kid who either needs to eat earlier or later than the rest of the family due to schedules just not matching up! This dish has TONS of flavor from the spices, feta cheese, and olives. 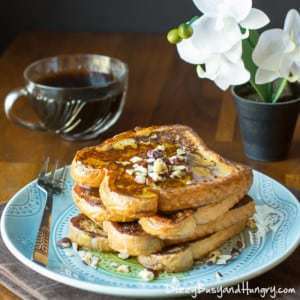 I purposely left salt out of the recipe since the cheese and the olives add plenty of salty flavor, so for those that routinely add salt you may want to hold off until you taste the final product. However, I did add pepper and that nicely balances out the saltiness in the dish. This is definitely a new family favorite! In a large skillet, start to brown the ground beef. When it is about halfway done, add the onion and garlic. Spoon off excess fat, then add the broth, olives, feta cheese, pepper, and oregano. Bring to a boil. Stir in the orzo pasta, and return to a simmer. 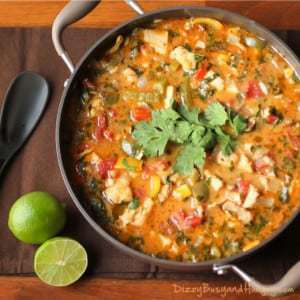 Reduce heat, cover, and simmer for about 12 minutes. Add the spinach on top, the recover and let cook for another 5 minutes, so that the spinach wilts. Stir in the spinach. Then add the chopped tomato and stir that in as well. 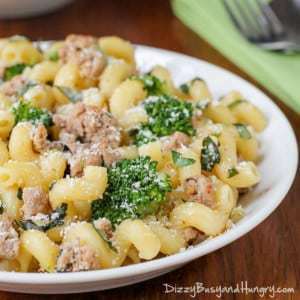 Interested in some other easy pasta recipes? Skillet meals are so fun! Thanks for sharing this with SYC. This sounds so good! Thanks for sharing at the To Grandma’s House We Go DIY, Crafts, Recipes and More Wednesday Link Party! I pinned this! Hope to see you again next week. LOVE a one skillet meal! Thanks for sharing with us at #HomeMattersParty! 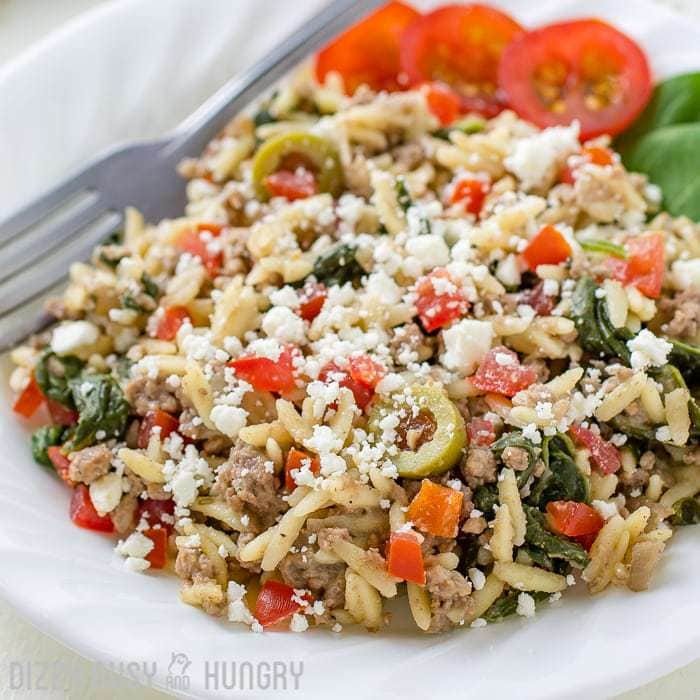 Orzo is my absolute favorite pasta! 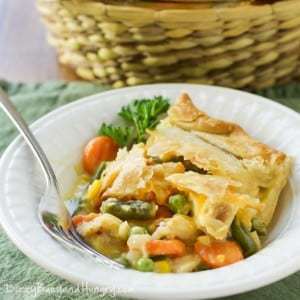 This looks good – Thanks for sharing at the What’s for Dinner party – hope to see you next week too. In the mean time, have a fabulous week! I’m excited to try this tonight for dinner! I’m using roasted red peppers instead of tomatoes since my hubby is (sadly) allergic. Thanks! Hi Kat, I am not able to find you on Pinterest. Can you make sure you are following me and then we can try again? Thanks! 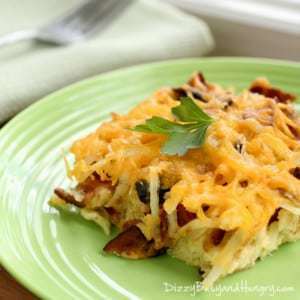 This is a great skillet meal, it looks delicious. Thanks so much for sharing your post with us at Full Plate Thursday and have a great weekend! Wow!This looks so appetizing! I might have second serving! 😀 Thanks for taking this along with you at Fiesta Friday party! I love orzo!! Thanks for sharing at the What’s for Dinner link up!